The idea recently came to me that I should try to one-up those silly motivational posters you see going up almost everywhere. So I took an old photograph I had taken, then added the Zygote Dragon figure in Poser 3, and the captioning in Paint Shop Pro 5. The end result is much closer to what I prefer viewing. Whether anyone else does I do not know. The photograph itself is from a 4th of July celebration. It was taken on 25 speed slide film. The shutter was opened manually so I am not exactly sure of the time for the exposure. 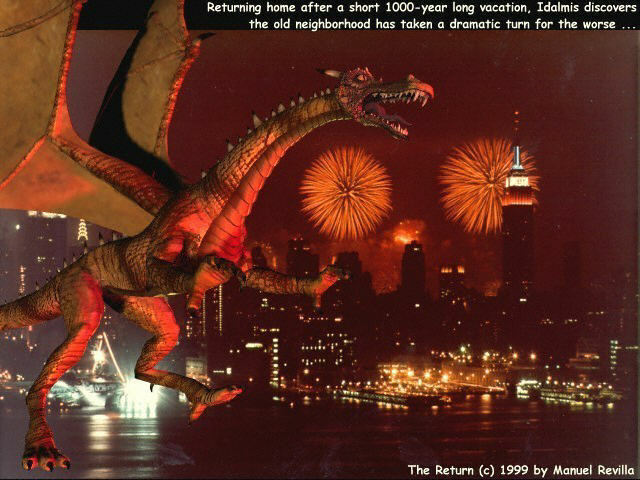 Compositionally, notice the fireworks are appearing behind the New York City skyline. I felt this created a more dramatic effect. Twilight Realms uses Digimarc software to digitally watermark its images. The Return is copyright 1999 by Manuel Revilla, all rights reserved. Twilight Realms is copyright 1999-2003 by Manuel Revilla, all rights reserved.